In June 2015, Microsoft caused quite a stir and hoo-ha when Terry Myerson, Microsoft’s Executive Vice President of the Windows and Devices Group, stated that Microsoft will continue to offer Windows 10 to customers running devices in a non-genuine state even though the free offer to upgrade to Windows 10 will not apply to non-genuine Windows devices. The statement immediately sets off news headlines that Microsoft is giving away free Windows 10 license to pirates running pirated copies of Windows on their system. Microsoft quickly refuted and denied that pirates are going to get free Windows 10 licenses. With the release of final Windows 10 RTM Build 10240 as the latest build for Windows Insiders, millions of computers are now factually running the final gold master RTM release of Windows 10, and this allows Microsoft’s statements about Windows 10 to be proven, incorrect. Officially, only genuine Windows 7, Windows 8 (through Windows 8.1, which is free for Windows 8) and Windows 8.1 get free upgrade license to Windows 10. But it appears that pirates can also get the free upgrade license of Windows 10, thanks to how Microsoft plan to allow everyone to clean install without new Windows 10 product key issued for the upgrade license. In fact, the non-genuine systems will become genuine and permanently activated after upgraded to Windows 10, instead of staying non-genuine. The loophole effectively allows everyone to get your free and activated copy of Windows 10. 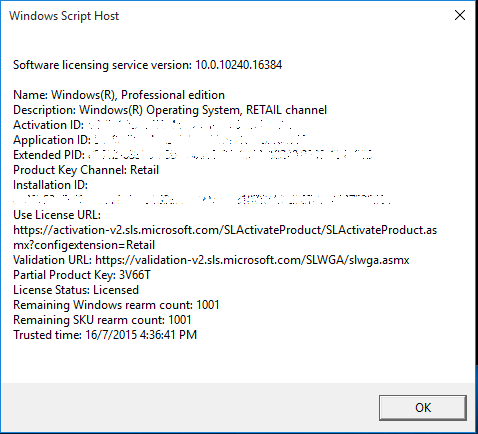 Windows 10 Product Activation is handled by Client License Service (ClipSVC) with tokens.dat file stored in C:\ProgramData\Microsoft\Windows\ClipSVC\ folder. Previously, Windows Product Activation is controlled by SPP (Software Protection Platform). Client License Service records hardware ID of the device in Microsoft’s server when an activated system that passes genuine validation check is successfully upgraded to Windows 10. The Device License is valid and system remains permanently activated with minor hardware change (such as changing hard disk drive), which caused change in hardware ID in the Device License, as long as it’s still with in tolerance with the device hardware ID. When system newly installed with Windows 10 for fresh and clean start, the system is automatically permanently activated with the hardware ID matched. When installing Windows 10 from clean state on the same device which has upgraded to and activated in Windows 10, no product key is necessary (skip the entering of product key during setup). Windows will automatically activated itself. If you attempt to use the generic product key to install Windows 10 on NEW device, it won’t activate. So, how do the non-genuine systems granted with genuine Device License and permanently activated status? The trick lies in the ability for various Windows activation hacking tools to make Windows genuine validation tool, such as Windows Loader which emulates OEM instant activation method, to believe that the current Windows system is “activated” and “genuine”, and allow the Device License to be granted and hardware ID to be recorded when upgrading to Windows 10. Once the supposedly “non-genuine” system is upgraded to Windows 10 with license status shown as “Windows is activated”, the pirates are now as good as any other body else who legitimately enjoy the free upgrade license to Windows 10. They can now perform clean install with system automatically activated without entering the product key. In addition to the free license of Windows 10 to non-genuine systems, Windows Insiders also receive free license of Windows 10, where the activation is done via similar Device License and hardware ID trick, with Windows Insiders free to stop the Insider builds.